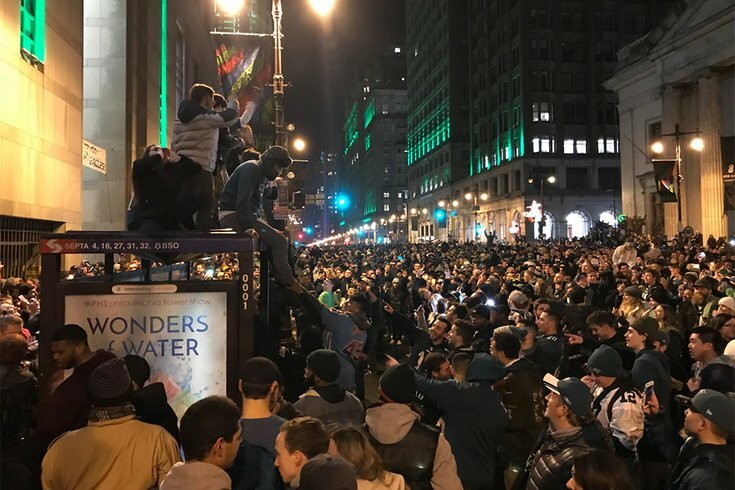 A huge crowd of Eagles fans celebrate on South Broad Street in Center City after their team defeated the New England Patriots to claim its first Super Bowl title. The Philadelohia Eagles are Super Bowl champions for the first time, defeating the New England Patriots 41-33, and it's time to party. Thousands of ecstatic fans are filling South Broad Street in South Philly and Center City; the intersection of Cottman and Frankford avenues in Mayfair; and Main Street in Manayunk. If you can't join the celebration in person, watch it live online. Below are live video feeds from other local media outlets' broadcasts.